No reading response exercise today. I am sick. Hopefully I’ll be back Wednesday. I’m taking a little time off for Thanksgiving. I hope you have a joyous holiday as you remember all the blessings in your lives, big and small! I’ll be back Monday with a new reading response exercise. Thank you for blessing me with your readership! Based on the events in the story and the things the main character is learning and discovering along the way, what would be a good theme song for your reading? Why did you choose this song? Write down or discuss your responses with your reading partners. I am grateful for the many friends I’ve made through SCBWI Oregon. This month’s art prompt features the work of one of them. 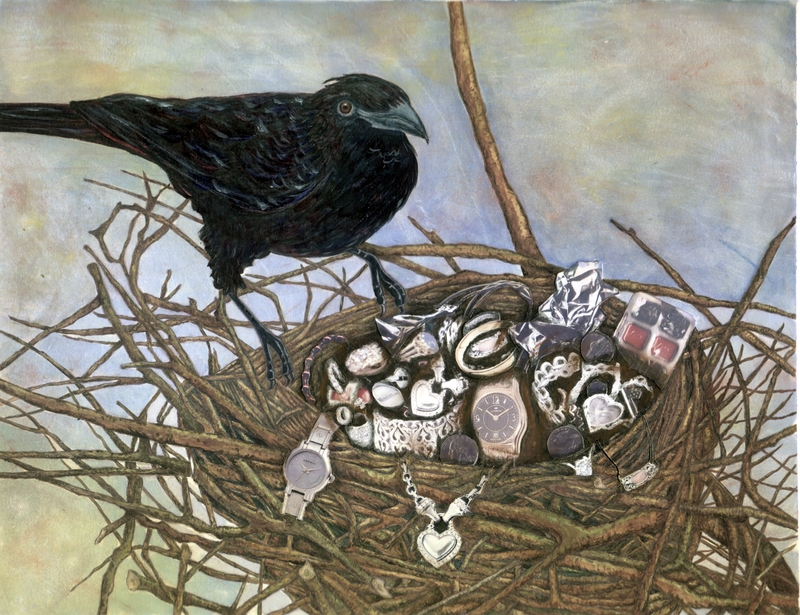 Johnny Raven has gathered a lot of objects in his nest. Choose one object that intrigues you, and write a story about that object and how it came to be part of Johnny’s collection. You might consider how it was made, who made it, who owned it before Johnny, or why Johnny had access to it. Remember, among the elements of fiction a story needs are plot and conflict, characters to play out the action, and a setting. When you are done writing your story, revise it to strengthen the plotting, characterization, and setting then share it with your writing partners. Compliment each other on the strengths in the writing and things you liked. Does your plot begin with an inciting incident that creates a conflict that needs to be resolved? Do/does the characters/character try to resolve it and meet with obstacles? Does the story reach a climax where action must be taken? Is there some sort of resolution to the story, be it positive or negative? Did you create original characters to play out your plot? Did you show what your characters are like through what they think, say, and do? Does the story take place in a real imagined environment? Do you utilize all the senses in your depictions of place, objects, etc.? Take your time with this assignment. Work on it, put it away, and get it out to work on it again. Due to the holiday weekend, there will be no new writing prompt next Friday. Enjoy using the extra time to really make your story shine. Johnny Raven was created by Barbara Herkert. To view more of her artwork, go to http://www.barbaraherkert.com. Sit down with your little one at the computer and show him or her the picture prompt. Identify some of the things in Johnny’s nest. Open up a word processing file somewhere on the screen where both of you can see both picture and page. Now ask you preschooler to tell you a story about how Johnny got one the things in his nest. Key it in as the child tells it. When you are done, read back what he or she has said, using the cursor to point to the words as you say them to reinforce the one to one correspondence between written and spoke word. Print out the story and, together, make your own pictures for it. November is the month for thanksgiving. Last November Literate Lives’ focus for the month was on gratitude. This year, I have let NaNoWriMo and other goals lead me in different directions. However, this is the month of Thanksgiving, and the holiday is nearly upon us. One of the things I liked to do as an English Language Arts teacher was to set aside some writing time for my students to write thank you notes to teachers and others they value in their lives. Even homeschooled students tend to have more than one teacher, be it a coach, a music or any other single subject instructor. I created thank you note “stationery” using Microsoft Publisher. Any program that allows you to combine graphics and text will do the trick. (Or you could bring in stickers, rubber stamps, whatever and let the kids create their own cards.) I made enough stationery for each student to write two notes. I required the students to write one note to one of their teachers (any of them, except me). The second note they could write to a staff member, friend, or family member. I took care of delivering all the notes written to school personnel, placing them in each employee’s box. My fellow teachers were always so surprised and delighted to receive the thank you notes the students had written. And in a school environment that is so focused (and rightly so) on the students, it helps the kids remember that teachers and staff are not mere furnishings of an educational system, but real people with who have committed their careers to educating and caring for students. The situation is win-win. And my students have the opportunity to put into practice the expression of their thoughts and feelings in writing for a real and specific audience. A literal question is a question for which you can find the answer directly stated in the text you are reading. An inferential question is a question for which the answer is not stated explicitly in the text you are reading, but can only be derived by seeking clues in the text. Write one literal question and one inferential question for the passage you read. Answer the questions. Discuss with your reading partners the questions you wrote and their answers and how you were able to deduce the answers based on your reading. Ask your preschooler one literal and one inferential question about the story you read together. Have fun, especially discussing the clues from the story that point to the answer to the inferential question. What do you think Albert Schweitzer is trying to say in this quote? What kind of light is he talking about? What kind of spark is he talking about? Have you ever felt as if your own light has gone out? Have you ever had the experience of someone setting you “alight”? Write your response to this quote, answering whatever question you may wish to address from above and discussing any further thoughts you have regarding the matter. When done, share what you’ve written with your writing partners. Compliment one another on the strengths of their writing and the clarity of expression of their thoughts. If you have written about someone who has helped you, why not send them a copy of what you wrote or a nice thank you note? If you are teaching my Greek and Latin Roots Vocabulary and Spelling System, it is a good idea to have a variety of study strategies to use to help your students make the meanings of their roots their own. After Roots for Early Dismissal, see post 10/19, Puzzlers was one of my students’ favorites. To start, have your students get out the current list of roots and pair up with a partner. They will need a sheet of paper and pen or pencil as well. Assign each set of partners one of the roots from the list and have them write the root and its meaning at the top of their paper. Discuss how roots are pieces of words whose meanings influence the definition of the word. Instruct them to make up words of their own using their assigned root and write a definition that is influenced by the root’s meaning. Impress on your students you do not want them to find real words that use the root, but rather to create their own words using the root. Require each set of partners create at least three words. I often offered extra credit points if they created more than five. After the students have created their words and definitions. Have them look over their list and circle the one they like best. Call on each pair to stand up and tell the class: their root, its meaning, their puzzler word, and its definition. Through sharing with each other, the students will have the opportunity to not only learn their particular root well, but to make associations with the other roots through hearing how their classmates have played with them. What happened in the pages you read? As a result of what happened in the pages you read, what could happen next? Write down or discuss your responses with your reading partners. And go ahead, read a little more to see if you guessed right. Read a story to your preschooler. At some point in the second half of the story stop. Ask if he can tell you what has happened so far. After the two of you have pieced together the plot, ask her what she thinks could happen next in the story. Brainstorm a few possibilities. Then read to see which of your ideas was correct. Yesterday, I reached 9,623 words.